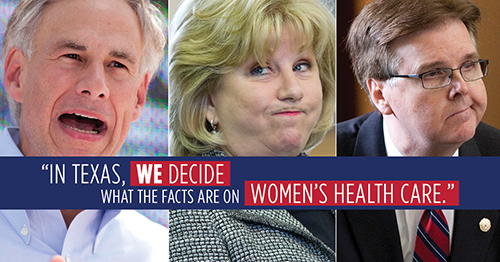 The Texas Freedom Network Education Fund today is launching a new statewide campaign confronting Texas politicians who have attacked state health researchers for telling the truth about the negative impact their policies are having on women’s health care. This bold new public engagement strategy, Texas: State of Denial, aims to shed light on the war on women being waged by state politicians. The campaign launch comes after a top Texas health researcher left his job following harsh attacks by state Sen. Jane Nelson, R-Flower Mound, and other state officials for co-authoring a recent study on controversial changes to family planning policies in the state. The study, which was published in the prestigious New England Journal of Medicine in February, found that the number of Texas women obtaining long-acting birth control through state-funded family planning services dropped by about a third after the Republican-controlled Legislature in 2013 barred Planned Parenthood from participating in the program. Meanwhile, the rate of childbirths covered by Medicaid jumped 27 percent among low-income women who had previously been able to obtain routine, highly effective birth control injections at Planned Parenthood health centers. The TFN Education Fund’s campaign includes radio and digital ads in top media outlets across the state and urges Texans to take action by signing a petition that will be delivered to Sen. Nelson, Gov. Greg Abbott and Lt. Gov. Dan Patrick. The petition calls on state leaders to stop putting politics ahead of women’s health care. “Texans should be concerned when state leaders politicize research and undermine women’s health,” Miller added. “It is simply wrong when politicians attack researchers rather than deal honestly with the facts on how their policies are harming women. For more information on this campaign, visit StateofDenialTX.org. The Texas Freedom Network Education Fund supports research and education efforts that promote religious freedom and individual liberties, including women’s reproductive freedom.